Large breed dogs will benefit from the top quality ingredients in Acana dog foods. With protein sources such as fresh chicken and flounder plus fresh apples; pears, pumpkin; sweet potato and cranberries. 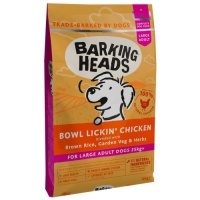 This is a delicious and nutritious diet for breeds such as German Shepherds; Newfoundlands; Great Danes; Saint Bernards; Leonbergers and many more large and giant breeds. 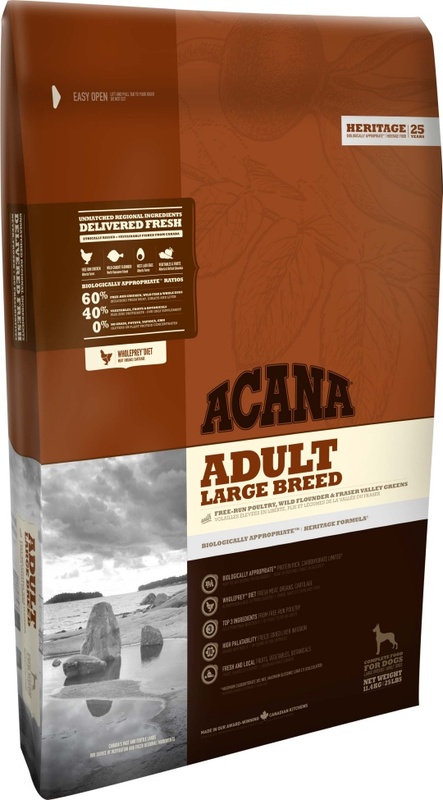 ACANA Large Breed dog food is rich in cage-free Cobb chicken; whole eggs from local prairie farms and wild-caught flounder from Vancouver Island. The sun-ripened fruits and vegetables from the Okanagan Valley add to the appeal for all large breed dogs. All the ingredients are delivered fresh and preservative-free every day. With Canada's best and freshest ingredients Acana Large Breed dog food is a delicious way to keep your big dog healthy and strong. Fresh chicken meat (13%); chicken meal (12%); turkey meal (11%); red lentils; whole green peas (8%); field beans; fresh chicken giblets (liver; heart; kidney) (4%); herring meal (4%); fresh whole eggs (4%); fresh whole flounder (4%); herring oil (3%); chicken fat (3%); sun-cured alfalfa; green lentils; whole yellow peas; pea fiber; fresh chicken cartilage (2%); dried brown kelp; fresh whole pumpkin; fresh whole butternut squash; fresh whole parsnips; fresh kale; fresh spinach; fresh mustard greens; fresh turnip greens; fresh whole carrots; fresh red delicious apples; fresh Bartlett pears; freeze-dried chicken liver; freeze-dried turkey liver; fresh whole cranberries; fresh whole blueberries; chicory root; turmeric; milk thistle; burdock root; lavender; marshmallow root; rose hips; enterococcus faecium.